Rigel Medical has introduced a new on-site calibration service for users of biomedical test and measurement equipment. The new mobile on-site calibration service ensures that biomedical test equipment such as electromedical safety testers, simulators and performance analysers continue to operate within original specifications and can be used with maximum confidence in terms of accuracy and performance. 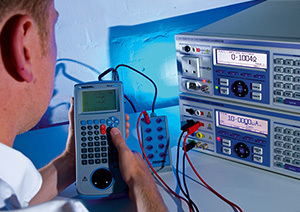 Carrying out the calibration of specialist test equipment on client premises minimises the cost, inconvenience and downtime associated with sending away vital test equipment for periodic maintenance. On-site calibration can therefore help to maintain the productivity of medical device field service teams and the equipment maintenance schedules of in-house test personnel. The new service is provided by highly trained and qualified Rigel calibration engineers. Visits to customer premises and service team working locations can be accommodated to combine full technical compliance with the flexibility of mobile‚ on-site working.